OXFORD, Miss. 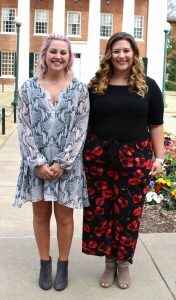 – The University of Mississippi School of Applied Sciences has honored Katelynn Tarr, of Pawnee, Illinois, as Undergraduate Student of the Month and Alexandra Eben of Olive Branch, as Graduate Student of the Month for March 2019. Tarr is a senior who is double majoring in nutrition and dietetics and exercise science. Tarr presented Holben’s research at the 2018 Food and Nutrition Conference and Expo regarding the correlation between food insecurity and Type II diabetes. Last summer, she traveled to Bruce to coordinate with a local library on a food program that incorporated nutrition education and STEM education. She plans to present findings from their summer research at the 2019 FNCE conference. Tarr is interested in continuing her research in Bruce this summer. Eben is a second-year graduate student working toward a master’s degree in social work after earning her undergraduate degree in psychology at Ole Miss. Through her first summer internship, Eben worked with a mitigation team helping inmates on death row with their legal cases. Her passion for social justice drove her to take numerous criminal justice classes as electives in undergraduate studies, alongside her psychology degree. Her second internship this summer will be practicing community mental health through Communicare in Oxford, working on group and individual treatment plans. Eben teaches valuable study skills and time management techniques through the Center for Student Education to students who have been asked to leave the university due to low GPA. Following graduation, she plans to become a licensed clinical social worker and work toward her doctorate. The School of Applied Sciences calls for Student of the Month nominations from faculty and staff throughout the school to recognize students for extraordinary scholarship, leadership and service. Faculty or staff interested in nominating a student for this honor can do so online at http://www.sas.olemiss.edu/som. The School of Applied Sciences, home of the Department of Nutrition and Hospitality Management and Department of Social Work, offers professional preparation programs that integrate academic study, clinical training, creative research, service-learning and community outreach, leading to the development of leaders whose professional endeavors will improve health and well-being.